Have you ever tried to show someone how to do something easy? Of course you have, you do it all the time without even thinking about it especially if you have kids. But what happens if you have 1000 people you need to show, who all have a different starting point, who all demand something slightly different, and there’s just one of you and not many other resources available to help. That’s one of the challenges I had at work last Summer. My employer changed their email system. 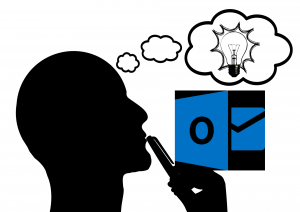 After many many years of the company using Lotus Notes for email we moved to Microsoft Outlook. I wasn’t involved in the upgrade project, I had plenty of other work commitments, and therefore didn’t know all the details and thought processes, but they did have someone advising on a training plan, though in the times and the business we are in (providing services to the oil and gas industry) resources are very tight and regrettably training is one of the areas that often takes the hit. They had to therefore provide something without much budget. The end result was a training resource, published on the company intranet, consisting of tips and links to selected Microsoft training videos on their website. For comparison previous similar projects (Microsoft Office upgrade for example) included external training presentations with all employees given the opportunity to attend but this wasn’t an option this time. Roll out day arrived and we all got down to using our new system. Of course after years of people complaining “why don’t we have Outlook like everyone else” the voices suddenly turned to “it was fine before”… but that’s a given! Very quickly more and more people started asking me for help. I have responsibility for learning and training in a particular business unit (over 3 locations) and particular business projects (that may span locations). Having 100’s of employees wasting time not using a system efficiently is not cost effective so I started looking at what I could offer to those I am responsible for. I also secretly relished the opportunity to brush off my long rested IT teacher skills to make a difference. I organise a lot of training at work, most of the topics and software is very complex Engineering software that I am not an expert in. I try and understand but I develop training and learning opportunities in conjunction with experts who really know their stuff. Outlook seemed like a doddle in comparison. I can use it, I can learn what I need to fast, I can run some nice training to help other people use it, it’ll be easy I thought. Then as you say in US English, I started doing the math. There was no way I had time to hold classes for 1000 students and I couldn’t provide customised learning to help different people with varying degrees of competence. I turned to a couple of Linkedin groups for help. One group “Organization Development & Training Forum (Sponsored by Degreed) gave some really good feedback with 17 replies to my post. The replies both suggested solutions and questioned my assumption. Inspired by the input I received from many experts around the world I went for a 4 part solution. Superuser training – I trained up a group of expert users who could support those working around them. I setup 1 hour classes for these volunteers, each class was split into groups and each group had to become an expert in a particular feature or area. They then had to share their learning with the rest of the group. The classes went pretty well and everyone learnt something new as well as where to find out more in future. Superuser e-mail group – I setup an email group for superusers to help each other out in cases where they didn’t know the answer. Drop in mini training – I offered 15 minute beginners classes in various basic topics, tips and tricks. These were not so well attended but it gave all who wanted more help the opportunity to attend. Dripping of information – We had some ready made nanolessons (short series of learning presentations) available for Outlook which were made available for anyone who wanted. I also sent out a few emails with tips and tricks, links to training videos (that had always been available) and reminders of who to contact for help. Honestly the answer is yes and no. The complaints about “why doesn’t Outlook do this?” have stopped. This is partly because people now know how to do what they need to do to some extent due to the training that was offered. It’s also partly down to Outlook being pretty easy to use and people supporting themselves and their peers to learn. So knowledge has certainly improved and part of that is due to the initiatives taken. But I still regularly come across people who aren’t aware of certain productivity features, so although the urgent need might have been resolved the problem is not completely solved. Of the four solutions above the email group remains almost not used, partly because it took so long to get going and I guess it was an initiative too far. In my experience not everyone is happy asking questions to a group, while most are happy asking one to one. The drop in mini training was not popular but did a job in that people had the opportunity to attend. The nanolearning also offered some support but like the drop in training I think the result is also partly psychological, as long as people know support is available they feel a bit more secure! The dripping of the information I think was the icing on the cake, the original Microsoft help videos published by the rollout project were good, but having them published on the Intranet is not good enough, they needed pushing out better and giving people that push and the affirmation that it was okay to take 10-20 minutes of the day learning to use the software, made the difference. Is the job done? Yes for now but of course I’d like to do it even better . It was a fun problem to look into now but unfortunately now my time is better used on the other hundred problems and issues that are calling. Not convinced that sometime the easiest problems are the hardest to solve? Try and teach my parents to use their mobile phones and come back to me.